Twinkle is making food, Usha scold her that she have put so much salt in it and she know where her concentration is and that her mother should concentrate on life too, as anyone can come in her house but if a man comes in her house stealthily then her image will be tarnished, atleast she should think about their respect. Twinkle is hurt listening to this, Kunj comes there and sees her sad, Twinkle leaves. Kunj tells his mother that she shouldn't have talked to Twinkle like that, and they should not involve in their personal matters. Usha says they have relation with them and they should care, and warns Kunj not to involve in this. Kunj says thats what he is saying that Twinkle will feel bad. Usha asks what about her? She tells Kunj that from the time he have gotten married, he just keep talking about Twinkle and Leela, and he don't love her anymore. Kunj asks what is she saying, he assures his mother that they both are his mothers and he is lucky to have mother like her and mother-in-law like Leela. Usha says thats the things, that he have forgotten the difference between mother and mother-in-law. Usha leaves while Kunj is tensed. Twinkle talks to Chinki on phone and says she have given her email id and phone number and now she is checking the profiles, she ends the call. Kunj asks which profiles is she checking? Twinkle thinks that he lies to her and wants to know about everything that she do and decides not to tell him her plan, she says she have registered him on a site and on this site one can sell her husband and can get free gift vouchers. Kunj asks if he can get a good wife too from there? As she always answer him wrong way, both stare at each other. Later, Kunj smiles looking at his phone. Twinkle says Maya must have messaged him and to make him jealous, Twinkle asks if he know she met Chinki today, and they saw a hot guy there. Kunj says good, Twinkle says she have decided today that.. But Kunj gets call and leaves before Twinkle could say anything. Twinkle thinks that he is busy on calls with her too and wonders what's happening here. Kunj ends the call and comes in the room, he says he have some work and he leaves. Twinkle gets angry as she feels he goes to meet his lady friend. Kunj comes to some place, Twinkle’s father switch on the light and he says he wanted to talk to him. Kunj who is still upset with him for leaving his family asks for what? Raminder who approaches Kunj asks him for help to get his family back. Kunj says after what he did, he think after that he will help him? Raminder says he is ready to bear anything but he want their forgiveness. Kunj says he don't deserve it but Raminder says he know he was wrong but he love his family like he used to and that he left his family because he was helpless, he lived in guilt his whole life, his business was in loss then when he had accident and after he returned, he found Leela shifted to Amritsar then he got to know that Leela got the money of his insurance as all thought he died so he thought if he return then the police will arrest him for fraud and the money will be taken back from Leela too so he left Twinkle and Leela so that Twinkle have nice life. He tells Kunj everyone gets a chance to rectify their mistake, he folds his hand in front of him and asks him to help him. Kunj asks him not to fold his hands infront of him as he is elder to him, he is his father-in-law and he is right, his mistake can't be forgiven but everyone should get a chance to rectify their mistakes, he is not promising him but he will try, and that about Twinkle, he can't tell her about him being alive and his mother-in-law will decide it. Raminder says as he say. Kunj says first his mom ( Leela ) has to forgive him and tells him to come to Guradvarah temple tomorrow. Raminder is impress with him and says nothing give him more happiness than the fact that he is his daughter’s husband and Twinkle is lucky to have him. Kunj leaves. Kunj and Leela comes to Guradvarah, Leela asks what the matter is? Kunj says he thought to come here with her, he sees Maya and introduce Maya to Leela that she studies with him in college, he tells Maya that she is Twinkle and his mother. Leela asks why Maya is crying? Kunj says she is married and have problems in marital life, he encouraged Maya that she can share things with her and she will give her best advice. Leela tells Maya that everyone have problems and she is not alone but not to give up. Maya says she keep trying but she don't see a way. Leela says she should keep trying to make her relation strong and if she need her then to call her at any time and she will do anything she can for her. She further tells Maya not to thinks she is alone. Maya hugs her and thanks her, she says she didn't know what to do and Kunj supported her too and that friends are for this only. Maya further says if her parents were alive then she wouls have shared things with them, she feel alone and she felt so good to talk with her. Leela assures her that she is not alone, she hugs her and bless her to be happy. Maya thanks her and leaves. Leela tells Kunj that he did good by helping his friend. At the same time, Leela’s husband comes thereand Leela is stunned to see him. She asks Kunj what he is doing here? Kunj says to make relation with her again. Leela asks if he brought her here to make her meet him? She asks her husband why did he come here? Kunj who makes Leela and her husband meet reminds her what she said to Maya sometime ago that they should keep trying to solve things. Leela angrily says she can't believe he is taking his side. Kunj says he met him yesterday, he could see guilt in his eyes and he want to help them both. He adds that she know she will take decision after thinking but he feel she should give a chance to him. Meanwhile Twinkle is in hotel on the lookout for a new partner for her mom. She meets an uncle Shekhar, they sit to talk, Twinkle thanks him for accepting her request on site, she says she wanted to meet him as this is about her mother’s marriage. Leela on the other hand tells her husband that he won her son-in-law’s heart but he think that she will forgive him and will let him in her Twinkle’s life? She swear that she won't let that happen. Kunj plead with her to listen to him, he puts Leela’s hand in her husband’s hand, Leela is tensed and looks at her husband. Kunj says they are in sacred place and he know she hate him but they get angry on a person who is important for them because there is love behind this hatred, and request her that for that love to give him one chance. Kunj adds that if she ask her heart then he know her heart want same thing. Leela bluntly says she don't want this and she can't forgive him, she then tells Kunj that he don't know anything. Kunj asks if she don't love him? And asks her to atleast not lie to herself, he tells her mom to remember the time spent with him and again asks if she have no feelings for him and don't she want him to be in her life again? Leela gets sad listening to this. Raminder stops Leela, Leela says she don't want to talk to him. He says he talked to Kunj as he want his family back. Twinkle is passing by and sees mother and Raminder talking. She tries to call out to her mom but she drive off and didn't hear her daughter calling her. She also sees Raminder going and she is worried. Shekhar meets Anita that he is getting married again and he met with a sweet beautiful girl who want to match him with her mother. Anita asks if he is really serious. Shekhar says he is as he has been lonely for so many years, he will like to move on and is waiting for the woman approval first. Anita asks for the name of the lucky woman. Shekhar says she is Leela Taneja. Anita is shocked and smirks to know this vital information. Twinkle is in her room. She wonders where Kunj is going as he is getting ready to go somewhere. She says he made plan to go out but he never tells her what he's doing. She asks him where he is heading and he tells that he is going out for lunch. She asks him if he has stopped eating home cooked food. She asks him who he is going out with. He responds that he going to meet his friend. She gets upset and messes up his hair. He is surprised and she says that she knows he is going to meet Maya but it turns out to be her imagination. Kunj bumps into her and gets annoyed. He asks her where she is going. She responds that she is also going out to meet her friend. They bump into each other again. He asks her if she can't see him standing there. He leaves from there leaving her annoyed. She says that she doesn't know what kind of husband Kunj is as he didn't even ask her where she was going or who she was meeting. Leela and Twinkle are in a restaurant. Leela wants to know why Twinkle brought her there and asks whom are they meeting? Twinkle says that soon everything would be cleared up. She leaves for a little while that she is coming in a moment and asking her mom to sit down but she is unaware that Anita and Cherry hear about her plan and they decide to join in on the fun. Twinkle is walking past a table. Kunj is there with Maya and her lawyer. She does not see them but Kunj spots her. At the same restaurant, Cherry is present there. He is on the phone with Anita. He tells her that her work is done. Anita informs him that the man Twinkle is expecting to meet Leela will never come. Meanwhile, a man approaches Leela. She thinks that this is the person Twinkle wanted her to meet and say he must have been called by Twinkle. The man starts telling complimenting Leela's beauty. Leela asks him if he drunk and asks what kind of talk is this and ask who is he?. He tells her that he is spellbound by her eyes. Leela asks who is he? The man asks why is she shy? Leela gets uncomfortable and ask who sent him there. He informs her that her daughter wanted them to get married again. She gets angry and tells him to stop his cheap talks. She tells him not to bring her daughter in this. He says he like her and they can fix their marriage date, he holds her hands. Leela gets up and asks him how he dared to touch her and that he is saying ill words about her daughter. She orders him to get lost. Kunj hear her voice from where he is sitting, he comes there and asks his mom what is happening. Cherry, who is spying all this while wonders how come Kunj is there and thinks he should leave before Kunj spots him. He quitely leaves from there. Leela informs Kunj about the man's uncouth behaviour. Kunj gets angry and slaps the man. The man informs him that Leela's daughter sent him here to fix his marriage with Leela. Kunj is shocked. Twinkle comes back just then. Leela asks her if she kows this man. She denies knowing him and says she called someone else here. She says she wanted to fix her mother's marriage with Shekhar uncle. She tries calling the person ( Shekhar uncle ) she wanted to meet her mother but the calls go unanswered. Kunj is livid at this point asking her to stop all this. He calls her shameless. He takes his mother-in-law from there. Twinkle is sad. She spots Maya and thinks she was right that Kunj was meeting with Maya. Kunj is very angry and shouts at Twinkle. He asks her when she would stop behaving like a kid. She tries to defend herself that Shekhar is a very nice person and she thought to make them friends but Kunj tells her that nobody knows what is going on in her mind and even Shekhar doesn't know what she is upto. Leela intervenes and says to forget all that and that they should go home. 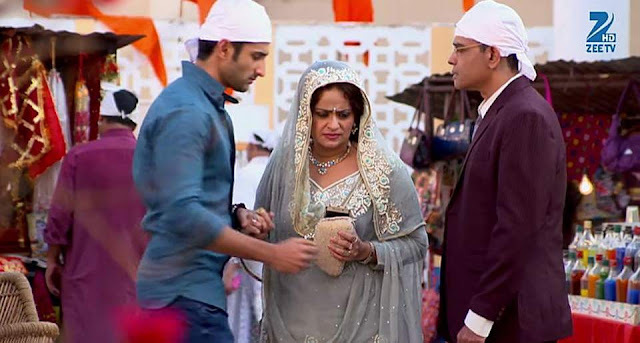 Kunj apologizes to his mother-in-law for shouting at Twinkle but he says she will never learn and asks when will her childish behavior go away? Twinkle is tearful and says she is sorry to her mother. She says she just wanted someone to take care of her and to love her as she is alone most of the time. Leela is surprise and asks why she did all this as she has Kunj and her ( Twinkle ) and she dont need anyone else. Twinkle says they aren't with her all the time. Leela ask them to go home. She tells Kunj not to fight with Twinkle on this matter. He nods and leaves. She then tells Twinkle to get Kunj in a better mood and that he is not happy with her act. She nods and leaves. Leela says she is in a predicament as she cannot tell Twinkle the truth as to why she cannot marry and she can't think about any other man as her father is alive. Twinkle tries to reason with Kunj. She asks him to listen to her but he leaves from there. She decided to call up Roshni from Jamai Raja. Roshni picks up her call and Twinkle tells her that she and Kunj has fought and she needs her help. She explains the situation to Roshni. Twinkle says she and Siddharth are perfect couple that's why she wanted to take advice from her. Roshni says they have problems too but they try to be with each other. Roshni advises her and says that they shouldn't keep secrets from their spouses as this can lead to problems and there should be respect and communication in marriage. They should trust their partner but she didn't do anything wrong. She tells Twinkle that she is glad that she is thinking about her mom that it's modern thought but she made a mistake by not informing Kunj of her plan. She tells Twinkle to tell Kunj everything and asks her to promise her to not hide anything from Kunj. Roshni says Kunj will understand her. Twinkle agrees and they end the call. Twinkle talk to herself that she will talk to Kunj and will make him understand. Twinkle meets Kunj and tries to explain that she was only thinking about her mother and she thought she will tell her about marriage thing later. Kunj asks her if she think what she did was right and maybe her mother wants something else. Twinkle says she is her mother and her mom did a lot for her so she only wanted her mom to be happy so that Anita doesn't keep insulting her. She want her to get married so that men like Raminder shouldn't be a part of her mom's life. Kunj is surprised and asks why is she bringing Raminder uncle into her talks. She say Raminder is spineless and let Cherry talk ill about her mom. She says she even saw him once trying to meet her mom on the way. Kunj says that maybe Raminder had something to say to her mother. Twinkle asks him why he is defending Ramindee. She says that Raminder can only being problems for her mom. She calls Raminder a cheap person who left his family behind when they needed him the most but she is unaware that he is her father. Kunj gets angry and says enough. He raises his hand at Twinkle and is about to reveal that Raminder is her dad but he stops himself in time. Twinkle is surprised to see this side of Kunj and asks him why is he siding with Raminder uncle. She says Raminder take advantage of women so she would get why Kunj is siding with him and get it why he have sympathy for him. She compares Kunj to Raminder that take advantage of girls and says he is just like that as he also tried to take advantage of her at the farmhouse. Kunj gets hurt by her words as she keeps reminding him about that night at the farmhouse. She asks if he remember that night addressing him as Kunj Sarna. Kunj says he remembers everything that happened that night. He says he remembers her blaming him for committing that heinous act. He says he recalls telling everyone that he was innocent and he didn't do anything but no one listened and believe him. He says he hasn't forgotten that night. He tells her that now he will give a piece of information to her, one that she will ever forget. He informs her that it was Yuvraj who had tried to take advantage of her and not him. He says that he had forgotten his jacket and had returned for it. When he arrived he saw Yuvraj with her. He says Yuvi even confirmed this fact when they were in Goa. Twinkle is shocked to her core. Kunj says he wanted to tell her then but Yuvi fooled them and started acting like a kid. He says to her that this is what had transpired that night at the farmhouse. He says he didn't forget anything but the sad and biggest thing is that she hasn't forgotten that incident either. Kunj tells Twinkle that they share a room together, they spend so much time together and still she didn't understand him. He says he never touched her and never crossed his limits with her. He asks if she still thinks he can do something like that. He says he would have crossed his limits had he not respected women. He says still she mistrusts him. He says their marriage is just a marriage as there is no trust and love in it. He says he don't know what this marriage is all about and does not know how he would tolerate this marriage his entire life. He angrily leaves. Twinkle break down and cries. He leaves from there with his bike. She follows him and tries to talk to him. He leaves the house, leaving a shattered Twinkle when she tries to stop him. She says she is sorry and that she was blinded by Yuvi's love and she was a fool to love someone like him. She says Yuvi only wanted to destroy her life while Kunj did nothing but protect her. She says that Kunj silently listened to her blaming him. He married her so that society won't point a finger at her and that he always protected her and never left her alone. She regrets not trusting him. She says her mom was right by saying that she won't get a better life partner than him. She says she sees that now, she is sorry that she didn't understand him, she plead not to leave her and says that Kunj should come back. She promises she won't ever misunderstand him again. Sajna Ve song plays in the background as she cries. Raminder tells Leela he wants to repent for his mistakes. Leela asks him to stop it. Leela tells him that her daughter wanted her to get married to someone and have all the happiness that she didn’t have all these years. She asks what should she tell their daughter, that her supposes to be dead father is actually alive and well but chose to stay away from them all these years because of his weaknesses.